I posted this on the Vista forum. But since it works just as well on Windows7, I post it here too. Over the years I have experimented with different imaging programs. I started out with Norton Ghost which works very well, but is quite heavy handed. Backup and restore cycles are usually approximately one hour and it takes quite some time before you understand the intricacies of the product. I have also used Paragon and Acronis true Image. Both of those are in the same league as Ghost. They do provide though a large collection of function – which, I guess, is part of the reason why they are complex and slow. 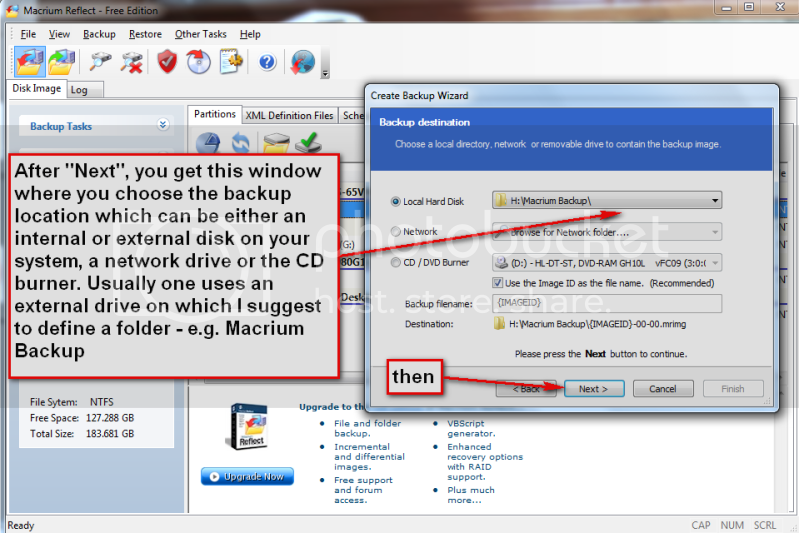 One that is easy is the Maxtor One Touch Manager that comes with the Maxtor One Touch Disks. My wife loves it because once it is set up, all you have to do is push the button on the One Touch Disk and off it goes. There is also a paid version with more functions. 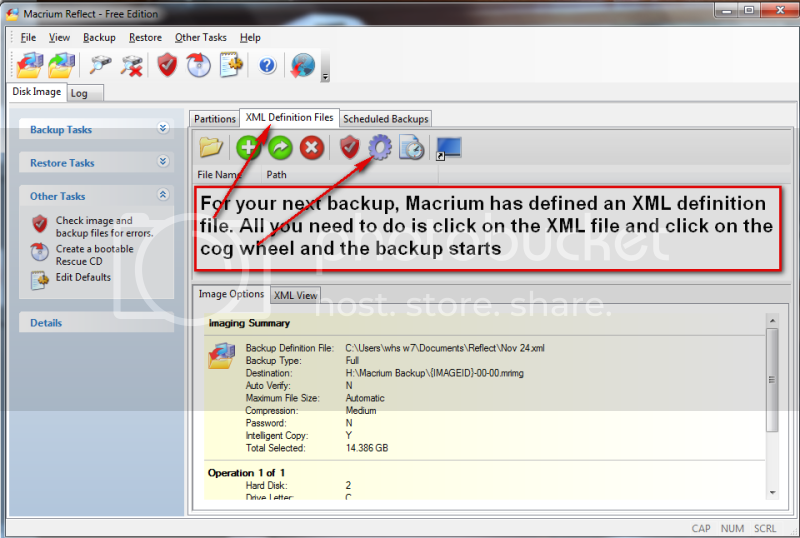 But for the normal backup/restore, the free version is sufficient. I did not document the restore function, in part, because I cannot take any screenshots during that phase. But it is very simple and self explanatory. All you need to do is set your BIOS boot sequence to boot from your CD reader, put the CD in (the one you burnt – see the first picture) and off it goes. 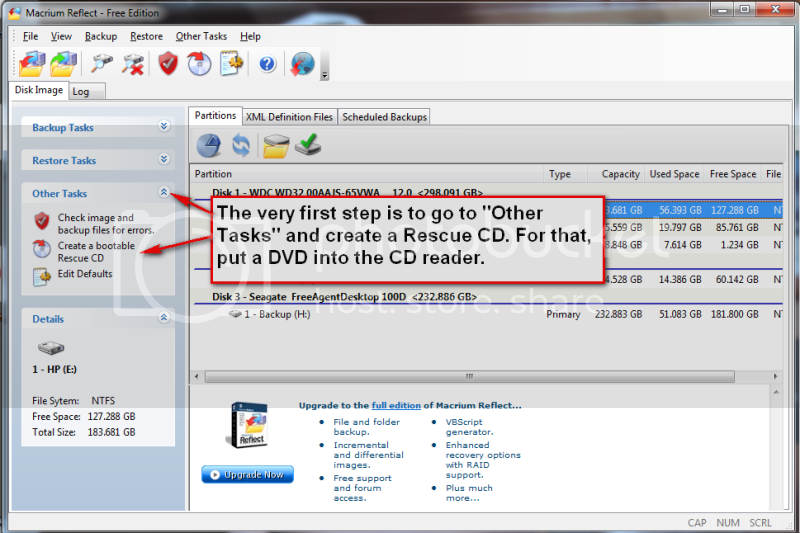 The CD loads a Linux based Wizard that will guide you thru a few simple questions. I have never used Macrium, but if it's a true clone, there should be no need to restore anything. One simply installs or swaps the clone drive into the spot where the C: disk resides and fire up the machine and you should be up and running as if nothing happened. As far as I know, Macrium Free does not clone. It makes images and restores them, but has no cloning feature like Acronis. But it has the best (uncluttered, user-friendly) interface of any imaging tool I have examined. Right, the free Macrium is an imaging facility. It is a no frills, easy to use way for anybody who wants a safeguard of his/her system. And it can be used often because it takes very little time to image (and restore) - as compared to the big guys like Ghost. It also compresses by about a factor 3 so that you need relatively little space on the backup volume. 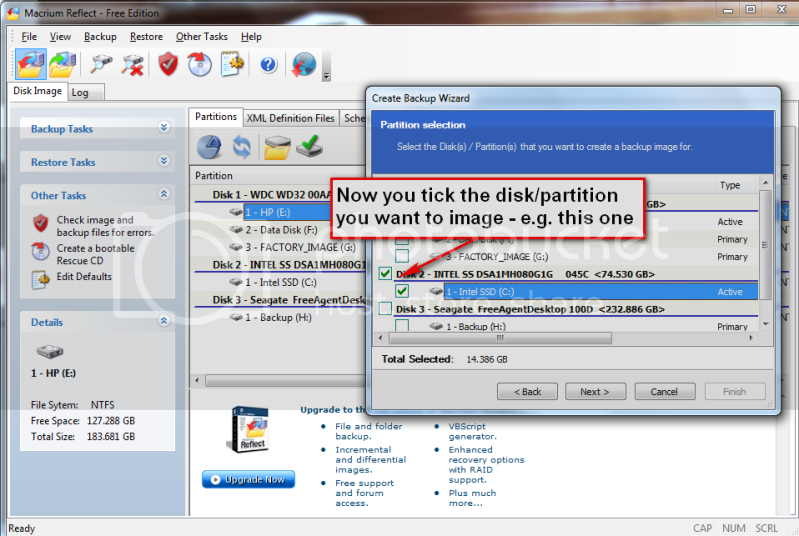 If you have a Seagate or Maxtor hard drive, (internal or external), you can use either Disk Wizard or Maxblast. 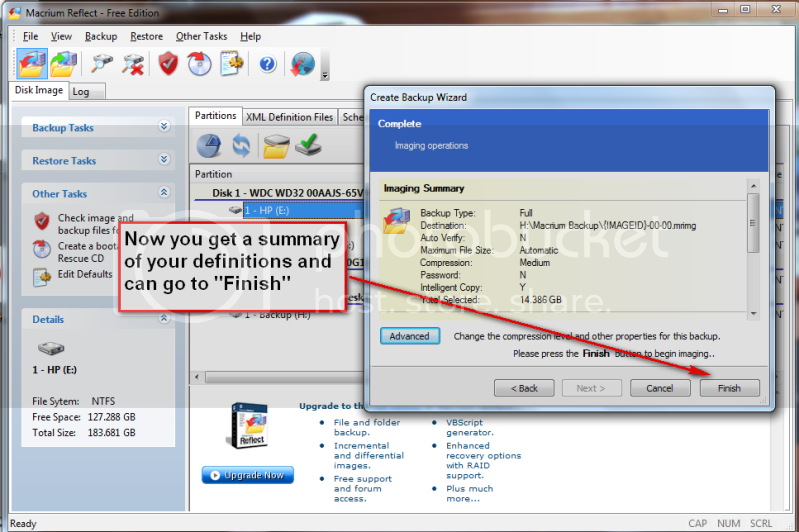 They both utilize a striped down version of Acronis's True Image and they are both are a free way to image your hard drive. I'm using clonezilla Clonezilla Open source and free. I use it to clone my drives as a backup. Takes 1 hour to clone a 320 gig drive. 7 does actually do this as part of its backup offer. How it compares I don't know. But snce this is a Win7 forum, this needs to be said. Other Info The mouse took most research. I hate that click on the wheel, this one has the old fashioned smooth wheel. There aren't many about. True, I have not tried it yet but some people reported problems with it. Maybe someone who has used it and actually done a recovery can give us an update. With Macrium I have done the whole cycle. It was easy, fast and without any problems - especially if I compare it to my Ghost which is big, complicated and VERY slow. Yes, my wife uses it on a Maxtor One Touch. Now after I set it up for her she only has to touch the button on the disk - she loves it. And it works on my Seagate also - but no button (I guess because they are the same company since about a year). 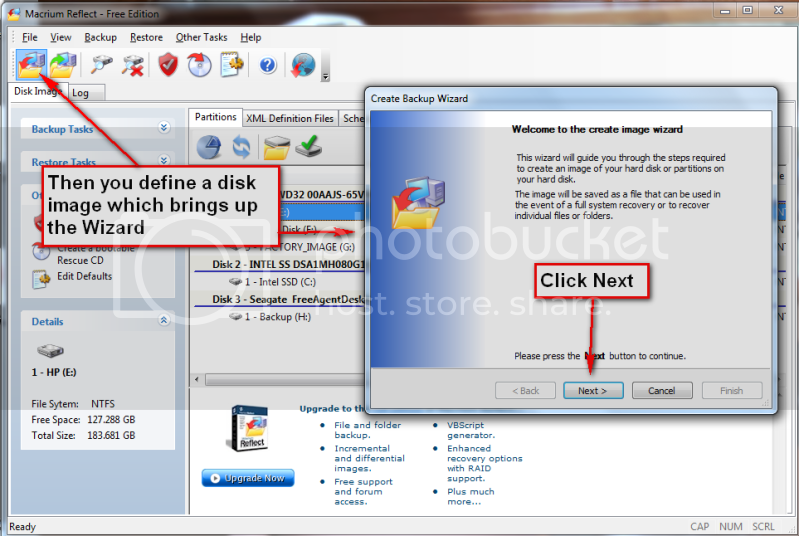 Several people have reported success with the Windows backup and restore utility in 7. Unfortunately it gave an error for me when I tried to restore an image I made with it which made me hesitant to rely on it. But if one tests it by attempting to restore an image made with it and the restore works, and if one is satisfied with the feature set and options available, then it's probably a great way to go.